Soptlight on my favorite or best designed cosplays and costumes. That dastardly sack of bugs. This costume is made with rescued burlap, lined with cotton, hand painted and covered in hand sculpted bugs. I love when someone comes to me with a challenge, an incomplete idea and I get to let my creativity play. This cosplay was commissioned to be something different using this charachter. Shy guy is one of my favorite Mario characters (behind Toad and probably ahead of Yoshi). Shy guys says is also still one of my favorite Mario Party mini games. Thanks to that this cosplay was an absolute joy to work on. I immediately thought of a horror twist with the game of Shy Guy says being deadly. 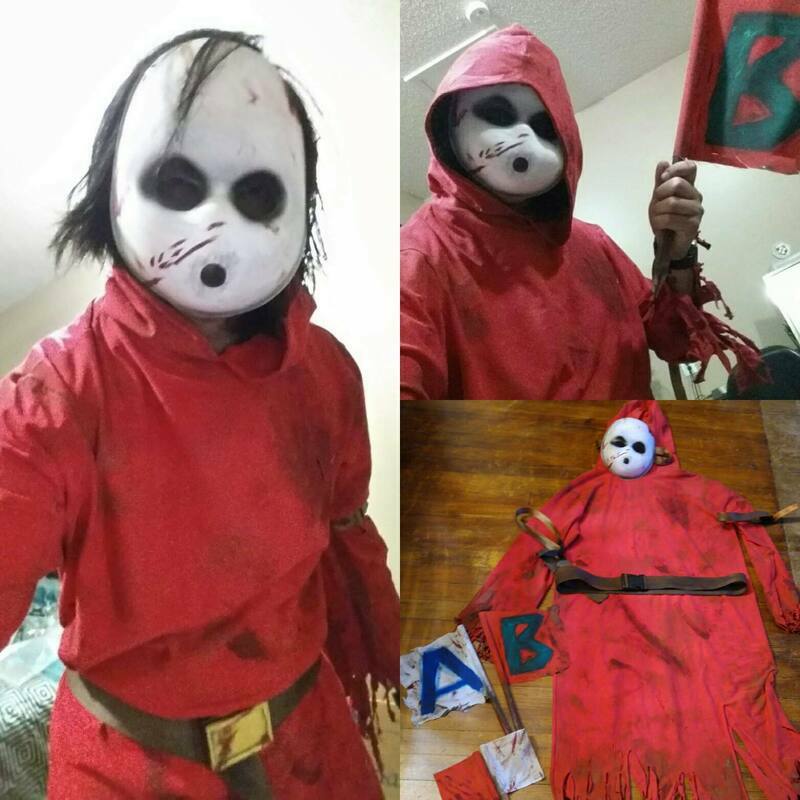 The costume came with the robe, belt, mask, and two sets of flags. One for Shy Guy the ends of which have been sharpened to deadly points and one set for the poor player. You better match his moves exactly or it's GAME OVER. There is so much to talk about with this costume. It took a lot of work and up to the morning the costume was supposed to be worn it was still was being worked on. This costume is made up of a dress, with "lego brick" details on the sleeves, Across the top of the dress the design is stenciled on. Same as on the over the knee stretch vinyl socks. Also included in the set are skull shoe decorations. Her hat, Vice Versa, roughly 5ft 5 inches tall from shoulder to fist closer to 6ft when you include the horns. the estimated weight is close to 10 lbs. It comes apart into three pieces that allow it to be transported relatively easily.